Pozole Rojo, Posole Rojo, Red Posole! Whatever you want to call or however you want to spell it, it’s so so good. I am from Mexico, so it’s pozole. I am particularly a fan of the red version, they come in green too, and I don’t discriminate any pozole, but red oh red. I am a huge fan of the red. 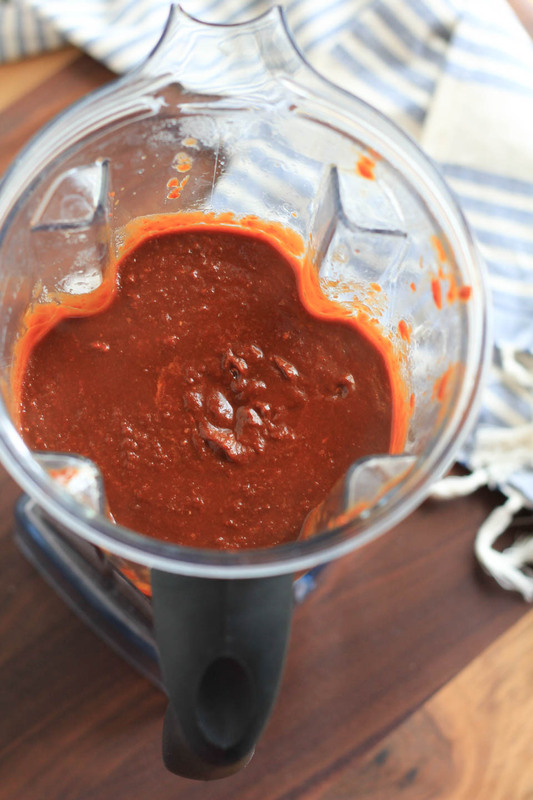 It has a blend of chiles that I use in my recipe, and you can really taste them, especially the day after you make it. I think the longer it sits, the better it gets. The flavors take time to meld, get all cozy with each other, a lot of things are better the next day. This happens to be one of them. It’s been a while since I’ve been back to Mexico where I was born. I’ve gone to my homeland, just not my hometown. The inspiration for this came from Torreon, where I was born and spent many holidays. It’s epic, like so many Mexican celebrations. We gather for Christmas Eve, which is just as important as Christmas Day, and we eat. Celebrate, dress up, go around to several family members houses, and eat more. By the end of the night we end up an my cousins grandmothers house where we have pozole. Or we go over the next day for pozole after we open gifts. This is how we roll, all night, epic eating, fun, family times. Since it’s been so long that I have been there for Christmas I thought it was about time I made pozole for this holiday season. 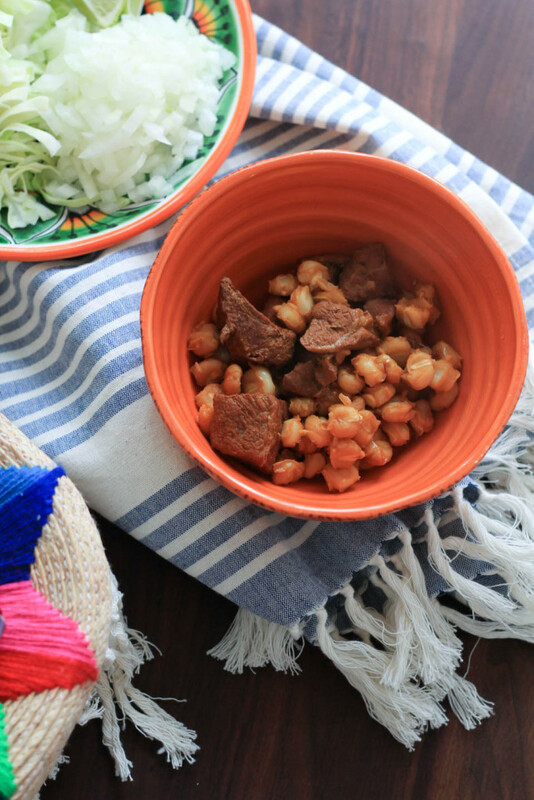 Honestly, it’s been so long I don’t remember all of the specifics, but the pozole always stands out in this food memory. 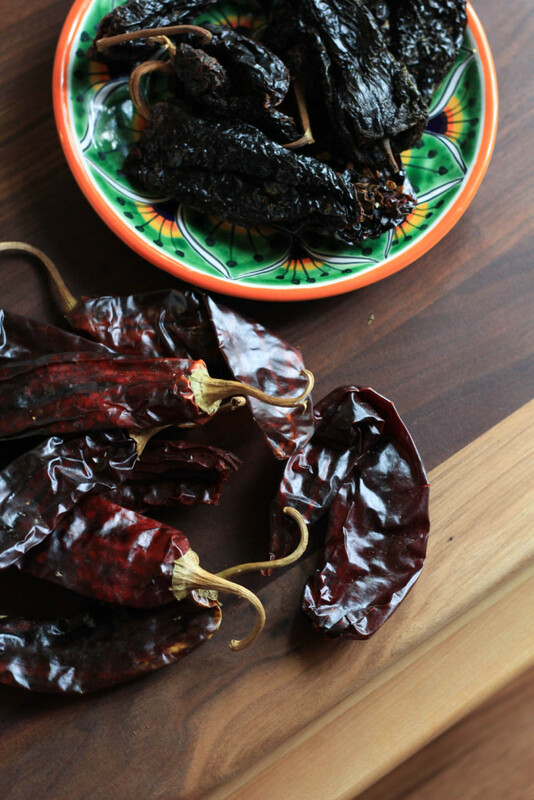 Place dried chiles in a large skillet, no oil, (do not use non-stick) over medium heat. Toast chiles for 1 minute on each side. 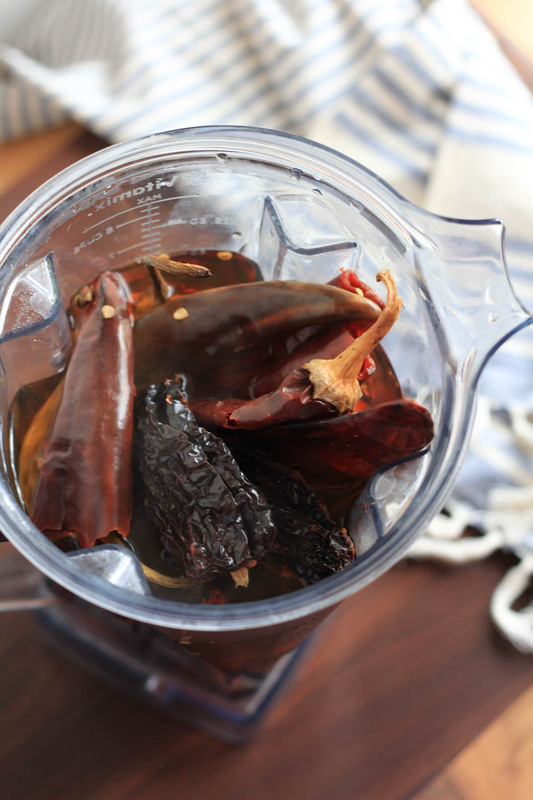 Add chiles to 1 quart water. Soak for 20 minutes. Add olive oil to 10-12 quart stockpot, place over medium high heat. Once oil is shimmering, sear pork over medium high heat, about 1 minute on each side until golden brown. Work in batches to sear, it will be about 2 batches. Add oregano, cumin, coriander, toast for 1 minute. Use a large spoon to scrape pork bits off bottom of pan, add a little water to help if needed. Add bay leaves, hominy to pot, then add water plus 1 tablespoon salt to pot, stir to combine. Bring to a boil, reduce to a simmer. Blend chiles, onion, and garlic on high until smooth. Strain into pot through fine mesh sieve, pushing through using a spatula or large spoon. Cover and cook over medium low heat for 2 hours. Add 1-2 teaspoons salt, stir to combine, leave lid off and cook for 1 hour. Remove bay leaves before serving. Taste for seasoning, add salt if needed. 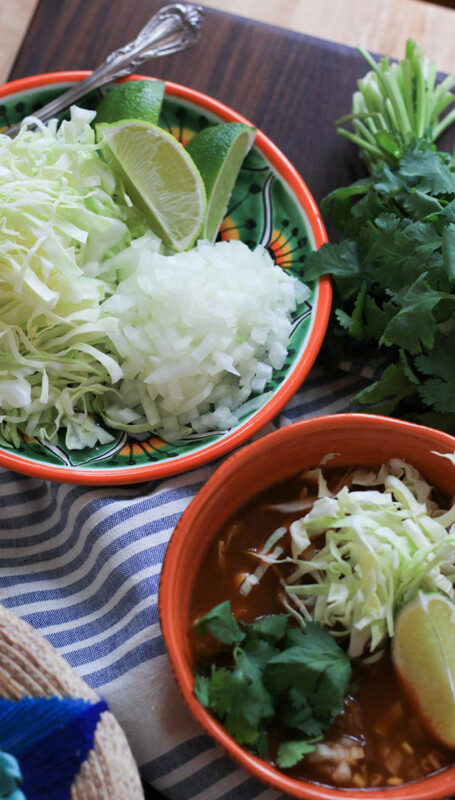 Serve pozole with cabbage, chopped onions, cilantro leaves, lime wedges, avocado slices, and tortillas. Store leftovers in an airtight container for up to 5 days. It tastes better and better each day. 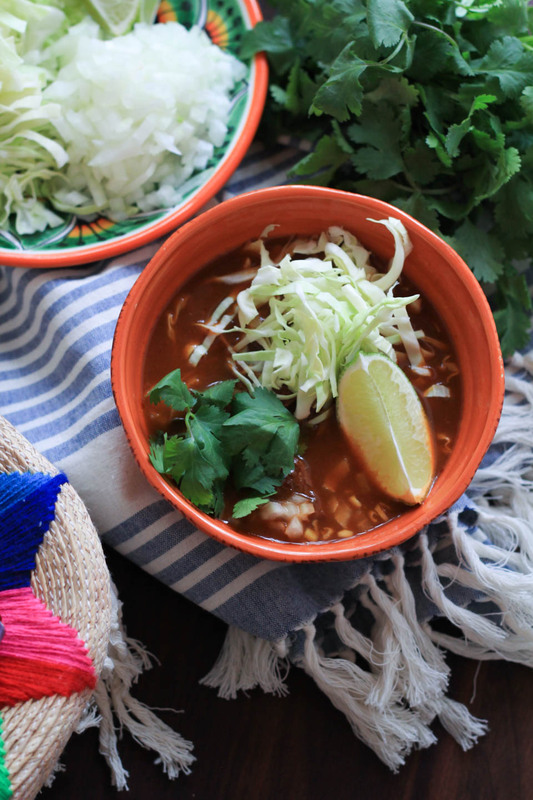 I’ve never heard of Pozole Rojo before, but it looks delicious! I love all the different chiles and flavours in this, bet it tastes fantastic! Oh I hope you try it since you’ve never had it, it’s amazing! 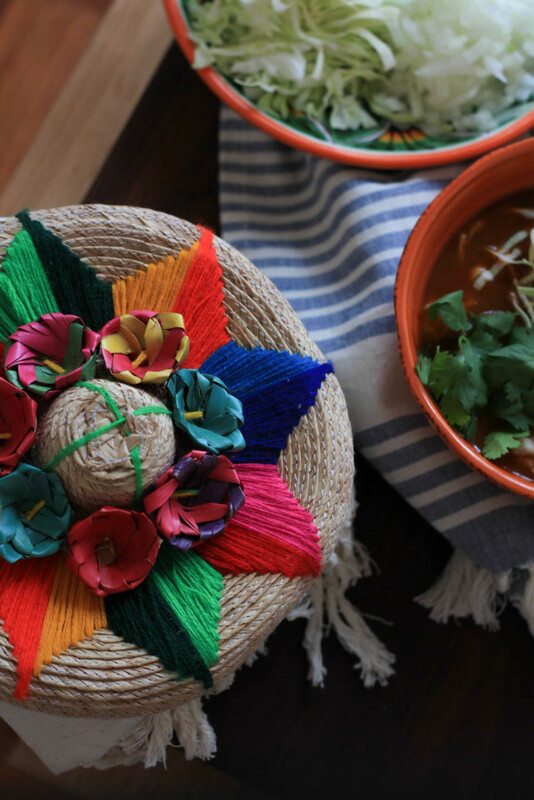 Pozole looks amazing! I need something like that to warm me up when it gets cold here!